Researchers at Clemson University (Clemson, SC) are working to develop a natural adhesive inspired by barnacles and their ability to cling to objects submerged in the water. The adhesive could be potentially used for medical applications as well as other industrial uses. The scientists had previously discovered that the adhesive used by barnacles in their last larval stage was complex and composed of lipids, proteins, and peptides. At this stage, the barnacle is roughly shaped like a shrimp. Once it finds a desirable firm surface, the animal glues itself to it, changing shape to encrust itself on it. The natural adhesive that the adult barnacle uses to affix itself to objects is so powerful that it can attach to virtually anything that is relatively solid--including animals like whales and vessels such as submarines and ships. Barnacle image from Flickr. Used under Creative Commons. 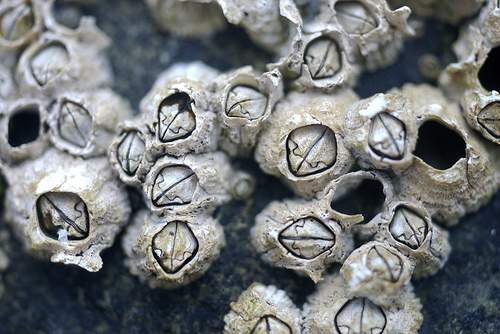 The barnacles can accomplish this by using a variety of adhesion strategies. To better understand how the adhesives work, the Clemson research used a two-photon microscopy system. The technique used, termed Broadband Coherent Anti-Stokes Raman Scattering, revealed that the barnacles excreted two phases of adhesive plaque: the first characterized by lipids and the other by proteins. "We believe that this lipid phase protects the protein phase from excess hydration and the damaging effects of seawater, and it may limit the protein phase from spreading too thin and losing its ability to securely adhere the larvae to a surface," explained Clemson University associate professor Andrew S. Mount in a statement. "The application of both two-photon microscopy and broadband coherent anti-Stokes Raman scattering clearly demonstrated the role of lipids, which we traced back to the cement glands and showed that they are produced and contained in a separate subsets of cells," he added. Marine animals like mussels and barnacles that affix themselves to rocks and other objects have inspired a number of adhesive research projects, and for good reason--they can resist constantly being subjected to crashing waves. The ability to accomplish this feat while being completely submerged in water has intrigued engineers, who envision the creation of bioinspired adhesives that can be used internally--withstanding the rush of blood throughout the body. There have been a number of research breakthroughs over the years that are inspired by properties displayed by animals. Examples include nanoscale polymer strands inspired by geckoes. Refresh your medical device industry knowledge at MEDevice San Diego, September 10-11, 2014. Brian Buntz is the editor-in-chief of MPMN. Follow him on Twitter at @brian_buntz and Google+.